I am pleased to announce the appointment of Mr. Michael Crawford, MBA, MHL, as Associate Dean for Strategy, Outreach, and Innovation (ADSOI) at the College of Medicine at Howard University effective April 8, 2019. In his new role, reporting to Dean Hugh Mighty, MD. MBA, FACOG, Dean of the College of Medicine and Vice President of Clinical Affairs (VPCA), Mr. Crawford will serve as a strategic advisor to the Dean and VPCA and collaborate with the College of Medicine leadership, Hospital and Faculty Practice Plan (FPP), Legal Affairs and General Counsel, Chief Academic Officer and Provost, Real Estate Development and Asset Management, HU Board, and other leaders across campus to advance HU’s academic, health, and innovation mission. Most recently, Mr. Crawford served as the Chief of Staff at Unity Health Care, Inc. (Unity), a nonprofit network of 20 health sites with more than 1,000 employees that serves over 108,000 patients annually, and one of the largest community health center networks in the United States. In this capacity, Mr. Crawford partnered with the President and CEO on the strategic and operational management of Unity and collaborated with members of the Executive Management Team on the execution of critical enterprise wide business initiatives to advance the organization’s mission. Michael was a member of the Executive Management Team and served as the President and CEO’s liaison between the Board of Directors, Executive Management Team, external stakeholders, government officials, funders, and staff. Prior to Unity, Mr. Crawford held domestic and international leadership roles in strategic management, operations, strategy, finance, policy, and business development at large corporations, nonprofits, and start-ups, including Johnson & Johnson, GlaxoSmithKline, and Gannett Company. Mr. Crawford holds a Master of Healthcare Leadership (MHL) with a concentration in healthcare administration and management from Brown University, Master of Business Administration (MBA) from The George Washington University with a concentration in Strategic Management and Finance, and a Bachelor of Science from Rider University with a concentration in Marketing Strategy. Mr. Crawford serves on numerous national and local committees, including the National Association of Community Health Centers Health Policy and Eldercare Committee, DC Chamber of Commerce Health Policy and Legislative Affairs Committee, Member of American College of Healthcare Executives, Member of National PACE Association, Member of Society for Healthcare Strategy and Market Development, and Board Member of Boys and Girls Clubs Greater Washington. 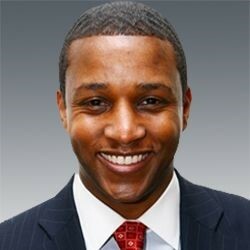 Please join me in welcoming Mr. Crawford in his new role at Howard University.